Even if you have never had a medical condition more serious than chapped lips, once you turn 50, it's easy to feel like your days are numbered. Moles you never noticed, little coughs, indigestion - everything is suspect. As much as I believe in early detection tests, there sure are a lot of them. Every time I go in for my annual physical and see that picture on the wall of all my internal organs (You know the one. It's been in every doctor's office you've ever visited since you were 10 years old), I still squeeze my eyes shut and tell my doctor to never, ever explain any of that to me. There’s simply too much in that diagram that can go wrong. No matter how good you feel, all these annual visits are nerve-racking. Now and then exam results put you in that gray area of "things to keep an eye on." In the case of unusual test results ("The talk of the lunch break room" I was once told), you will probably be told to come back in six months to re-test. For imaginative people like me, this can mean only one thing: brain tumor. I spend that entire six months positive I’m incubating something. Every time I have my annual exams in Denver, as much as I love my family doctor, I have to walk her through my medical history. With so many patients, she forgets things like irregularities in past exams. Do second opinions save lives? As far as tests are concerned, at issue is insurance screening guidelines. To control costs, insurance companies only allow doctors to give tests under certain conditions or within certain periods. A few years ago, doctors were accused of being overly zealous in testing and driving up costs. Nowadays, U.S insurance companies have strict guidelines. Irregularities might mean they test every year. If you have never had a bad test, your might wait as long as every ten years between tests. We all go by the same rules even though we don’t have the same bodies or family histories unless your doctor aggressively intervenes. Ten years ago, I experienced some strange symptoms. I knew something was wrong and suspected why (a post-divorce diet of chocolate and nacho cheese Doritos). My doctor couldn’t pin my symptoms to anything serious and guidelines (protocols) did not support more tests because I was under 50. I fought on, and got all kinds of tests anyway, paying out of my own pocket. My doctor told me later that I probably saved my own life. Subsequent articles by doctors indicate they are none too fond of protocols either. Sometimes as a patient you want what you want (as was my case), even when you're not sure why. (For a good article on protocols, read this piece by the Cato Institute.) We all have a sense of our weakest links from our lifestyles and family histories. Most of us know our bodies. Hospital Angeles del Carmen, one of the most important hospitals in Mexico. I’ve driven mine like a shiny red sports car, piling up years of demanding exercise and sports without fuel even close to the premium grade it deserved (my idea of a pre-work-out snack used to be a cup of coffee). Subsequently, I like to check some parts for wear more frequently than others these days. An expat friend of mine, eager for me to get back to Mexico this year said, “Why don’t you just get your annuals here? It would cost you fifty bucks” (she’s a salty one). That’s when I realized I can always soothe my inner hypochondriac in Mexico. My experience in the U.S. taught me how dangerous rigid guidelines are. If you’re a man, many health care insurers doesn't cover prostrate exams over a certain age. What’s that message? Why not get these exams in Mexico if an additional one would ease your mind? Living in Mexico and taking advantage of their very good healthcare system, plus keeping a relationships with U.S. doctors has the potential to provide you with options. Options are what this blog and website are all about. Have you ever heard your doctor say, “I can’t” on a test because of a guideline? I have. If I hadn't fought it, I'd be dead. All I was operating on was intuition and I found doctors aren’t always as responsive to your intuition as they are to their egos. What if you could get a second opinion not just from another doctor, but from another country and a whole other health care system? Particularly in Mexico's major cities, you'll find world-class specialists, many of them U.S. trained. In Mexico, labs advertise directly to the public. You may not even need a doctor to get a test run and it will cost less than $100. You may pay less at home for the first opinion if you have insurance but they sure won’t pay for second tests to assuage your intuition. America's healthcare system ranks behind Iceland, Italy and Greece, not to mention coming in last among first-world countries for over-all quality. Fewer doctors in the United States, along with the bigger percentage of their time they have to spend on administration, means that they have less time for you than their Mexican counterparts (you will see this commented upon over and over again on expat forums). AARP recently wrote an article reporting that of patients seeking a second opinion at Mayo Clinic, only 12% were accurately diagnosed by their primary care physician. More than 20% had been misdiagnosed and 66% required a revision to the diagnoses. Doesn't that make having a choice of second opinions and tests sound pretty good? Most recent: Contrary to popular belief about Mexico's produce perhaps being "fresher," eating healthy will be one of your biggest, unreported challenges living here. Next up: Ducking out, of the American economy and its politics. Frankly, it feels damn good. 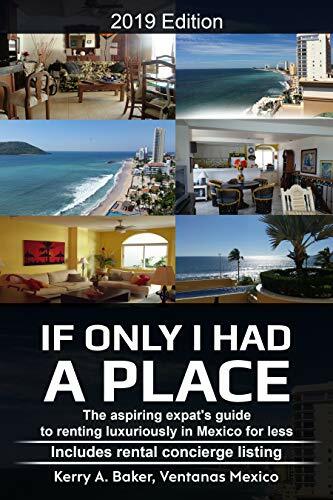 Hi, I'm Kerry Baker and a partner with Ventanas Mexico which provides insight and resources to those considering full or part-time expat life in Mexico, most recently "If Only I Had a Place" on renting here luxuriously, for less. I am also author of the "Interactive Guide to Learning Spanish Free Online," a curation of the best Spanish language tools on the web. Thinking about moving in a few years? Learning Spanish takes time and study. Get started with the Guides lesson plans on your laptop or e-reader. (Invest in a slim, lightweight laptop for travel, like the Acer Aspire.